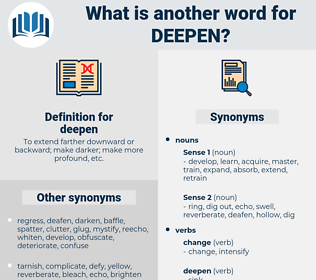 What is another word for deepen? To extend farther downward or backward; make darker; make more profound, etc. fuller, better, further, deep-going, in-depth, Heightened, Consolidating. 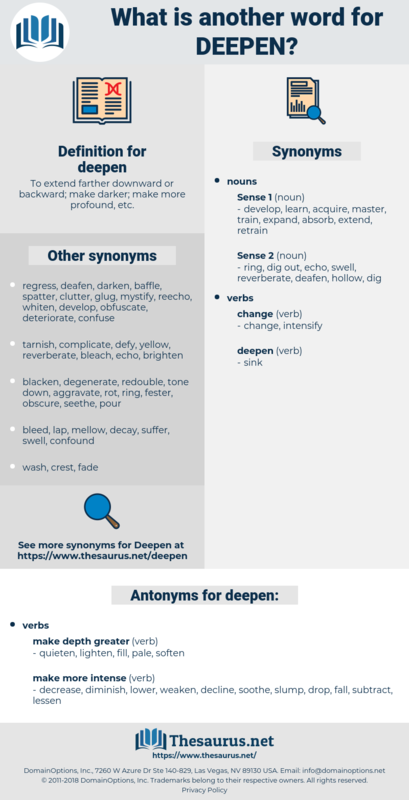 widen, broaden, exacerbate, sharpen, heighten, aggravate, delve, entrench, enlarge, augment, solidify, amplify, bolster, escalate, immerse, enrich, refine, deteriorate, upgrade, inflame, pursue, advance, elaborate, redouble, accelerate, reinvigorate, examine, dig, fortify, magnify, compound, toughen, diversify, dwell, grow, facilitate. quieten, lighten, fill, pale, soften. decrease, diminish, lower, weaken, decline, soothe, slump, drop, fall, subtract, lessen. tone, subside, moderate, dwindle, alleviate, taper, reduce, recede, subdue, ease, abate, wane. Mrs. Weber, observing Dan for the first time, addressed him in a kindly tone, which only served to deepen the frown on the amateur detective's face. Not only is man able, in the economy of grace, to retain the sweet consciousness of the divine presence in the soul, but in his hands are placed instruments that enable him to cultivate and deepen this consciousness and thus add glory to glory and cause his way to shine more and more unto the perfect day. dopamine, dauphin, defame, debone, devein, daphnia, diaphone, depone, divine, devonian, dipnoi, deafen, daphne, define, dobbin, devon, dubbin, dubnium, divan, deadpan. speed, condense, burst out, accelerate, speed up, break open, irrupt, quicken, sharpen, flare up, flare, redouble, erupt, build.